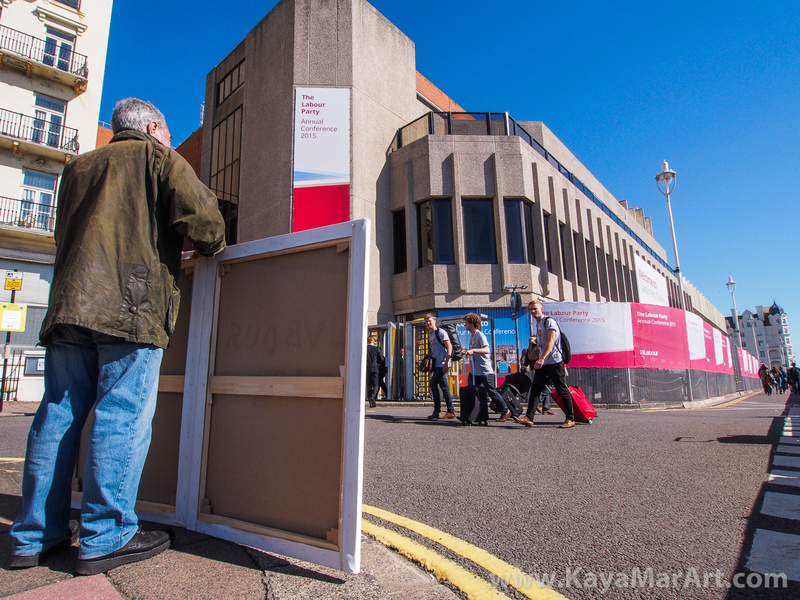 Kaya Mar is impossible to ignore as he stands outside the Brighton Conference Centre during the Labour Party Conference with three large satirical paintings. What better way is there to spend a beautiful Autumn day than popping down to Brighton with three large paintings and sharing them with all those lovely Labour Party annual conference delegates as they shuttled continually between the Grand Hotel and the Brighton Conference Centre next door? Brimming over with bonhomie, strong coffee and goodwill, Kaya boarded the train from Victoria station at some ungodly hour to rendevous at Brighton station with two documentary film makers, Dan Laughton and Sam Baker, who had approached Kaya to take part in their film “Artivism”, whose subject matter is political, activist, guerilla artwork and artists, three of whom are included in the film: Kaya Mar, “unofficial” war artist Peter Kennard and renegade political ceramic artist Carrie Reichardt. 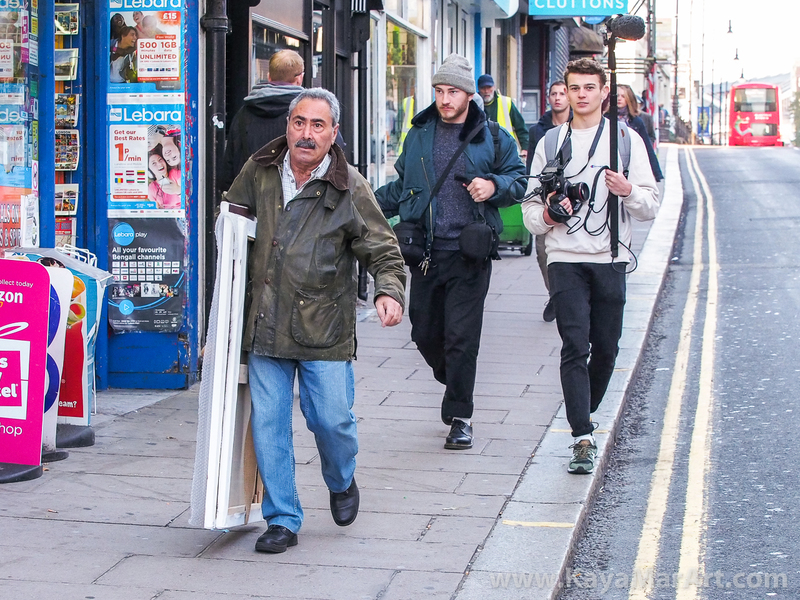 Kaya heads to the Brighton Conference Centre, followed by documentary film makers Dan Laughton and Sam Baker. “Artivism” will be released in a screening early next year and in festivals throughout next year, a trailer will be released in December. Kaya gets the attention of Labour Party Conference delegates. With the greetings and more coffee out of the way it was time to walk down the long, steep hill to the seafront where Kaya installed himself between the hotel and the (temporarilly) fortified conference centre, spending the day attracting attention from news video crews, photojournalists, passing members of public and, of course, the conference delegates and politicians who, as expected, had various “Marmite” reactions – depending on their tribal affiliations – to Kaya’s pointed satirical paintings which comment ascerbically on various aspects of Jeremy Corbyn’s controversial installation as party leader.